Dimensions: All backlit frames are 3.5″ deep. At this depth, they also make great shelving that can fit bottles, glasses or other small items. Each picture reacts to the LED lighting in it’s own unique way. Some color pictures look awesome with oranges in purples that give the illusion of a sunset while some you may just want to keep on white. 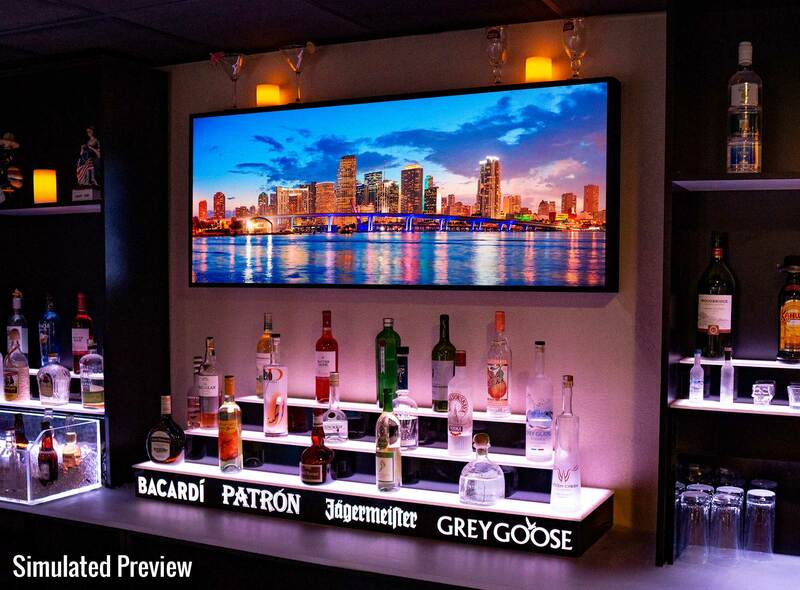 With our lighting system, you can create your own custom programs that use only the colors you like the most. Or, you can just keep it on a single static color. Black – Black frames are made with matte black, cabinet grade laminate. Wood – All wooden frames are constructed out of solid hardwoods. 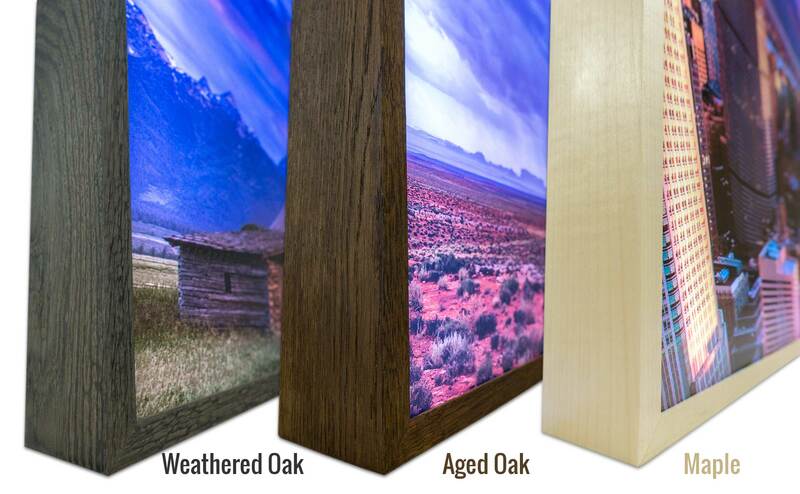 Due to the nature of real wood, the grain pattern and overall look can vary significantly from frame to frame. You can personalize your lighted picture with custom text, your company’s logo or virtually anything else for free! To customize your picture, click the ‘Customize’ button to launch our interactive designer. You can also contact us and we can add your personal touches for you then send you a proof before or after you purchase. All of our lighted pictures include the necessary hardware and mount as simply as a normal picture frame. Our lighted signs do require being plugged into an outlet. They are not, and cannot be battery powered. The power cord will come standard out the right side of the frame. The back of the sign is removable which will allow you to reroute the power cord if needed. The back can also be easily cut with a razor or knife to accommodate an outlet directly behind the picture and to reroute the power cord. If you plan on putting an outlet behind the picture, we recommend using a recessed outlet so the plug/cord doesn’t cast shadows on the front of the artwork. What will my picture look like turned off? Our lighted pictures are printed using a special process and are designed specifically to be used with LED lighting. This means that they may not look correct when turned off. This will vary from picture to picture but usually without the lighting, the image will appear very dark and the colors may not be quite accurate.